Make sure the lycopene supplement you take passed our quality review and is right for you! Lycopene is an antioxidant carotenoid found in foods like tomatoes and watermelon. Some evidence suggests that diets high in lycopene may reduce the risk of certain cancers and have heart-health benefits, such as lowering cholesterol. Small studies suggest that lycopene supplements may be helpful in men with prostate cancer and for male infertility. But which lycopene supplement is best? 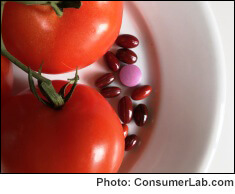 ConsumerLab tested and reviewed popular lycopene supplements. The tests revealed that one product contained just 59% of the lycopene claimed on the label and that the cost to get an equivalent amount of lycopene from products ranged from just 7 cents to as much as 58 cents! Among the supplements that passed all tests, ConsumerLab selected one as its Top Pick, providing a good dose of high-quality lycopene at a great price. You must be a member to get the full test results, along with ConsumerLab's recommendations. You'll get results for 11 lycopene supplements -- eight selected by ConsumerLab and three others that passed the same testing through our voluntary Quality Certification Program.